A masked vigilante helps his twin brother track down rustlers./An outlaw gang tries to get their hands on an innocent girl's fortune. Ted Wells (1899-1948) had been a cowboy star during the silent era, making his debut in Universal's Straight Shootin' (1927; directed by William Wyler) and then gaining a respectable following for pictures such as Desert Dust (1927), Born to the Saddle (1929) and The Border Wildcat (1929). He essentially retired once sound was introduced, but director Robert J. Horner made plans to bring him back in an eight-film series for Aywon Pictures. 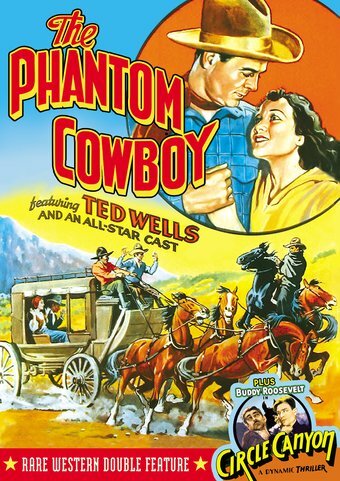 Only two films, The Phantom Cowboy and Defying the Law (also 1935) materialized, however. Afterwards, Wells quietly returned to his retirement. Sidekick Jimmy Aubrey had starred in his own series of silent comedy shorts from 1919 to 1925, always sporting his trademark "double brush" mustache. CIRCLE CANYON (1933): Abandoned by her father, then orphaned by the death of her mother, young Lucy has been left in the care of cowboy Chris Morrell. She's also inherited a fortune from her mother's oil well. To protect the money, Chris agrees to become Lucy's legal guardian, but first he must track down her father and get his consent. His mission is complicated by an outlaw gang who are eager to get their greedy hands on the girl's money. A year after the release of Circle Canyon, Lone Star Pictures released an almost line-for-line remake starring John Wayne, 'Neath Arizona Skies (1934). The only major alteration was changing the name of the female lead from Lucy to Nina. Buddy Roosevelt (1898-1973) was a major western star in the 1920s, working for Pathe, Universal and Paramount. Parts dried up for him once the talkies came along, but in 1933 he signed a four-picture deal with Superior Pictures. Paid $250 for each one, these would be his last starring roles. Director Victor Adamson had previously produced and starred in a series of westerns as 'Art Mix' until popular cowboy actor Tom Mix sued him for copyright infringement. His son Al carried on his legacy as a director of exploitation features, including Dracula vs. Frankenstein (1971).